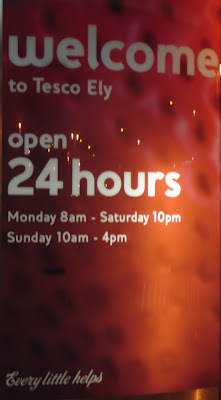 That's "open 24 hours most days" to you, Americans. That's what the sign was telling us. We laughed and laughed and laughed--and laughed all the way over to the train station, where we discovered that our having fallen for such an improbable concept as a store open beyond 5 on Sunday had left us a 45 minute wait for the next train to Cambridge. Strangely, no one on said train laughed when, moments before we arrived at Cambridge, the train manager came on the public address system to announce that the train would no longer proceed to London but would instead terminate right there at Cambridge. Where everyone could cross the platform to take a different train to London. As someone who would love to have even a wildly dysfunctional train service at home--one that, say, could take her somewhere she needed to be, without occasioning bizarre middle-of-night car trips into rough or semi-deserted areas in faraway cities--I felt flickers of sympathy but not a lot more as the entire train grumbled to its feet and began hauling luggage down from the racks. Tomorrow, I'm hoping to tell you what I learned yesterday about a more profound kind of brokenness.